In news that has left me vulnerable to feather related knock-downs, Paul Heaton has announced that he will be touring Australia in October 2012 for what I think is the first ever time. I had long assumed our shared passion for not dying in aeroplanes ruled out any chance of me ever seeing Paul on these shores, and yet here we are. Clearly he has faith that his lucky pixie and Simon le Bon calling card (previously used as inflight lucky charms) are working well. Whatever the reason, it is ace news. Anyone who has ever had a casual glance at these pages would know my appreciation for all things Heaton - the pop star against which all others should be judged. It's been 23 years since my first concert - a Christmas night out at Bridlington Spa with the Beautiful South. The newly formed band went to such lengths not to play Housemartins songs that they did You Keep It All In twice and offered covers of Pebbles' Girlfriend and the Bee Gees' You Should be Dancing. 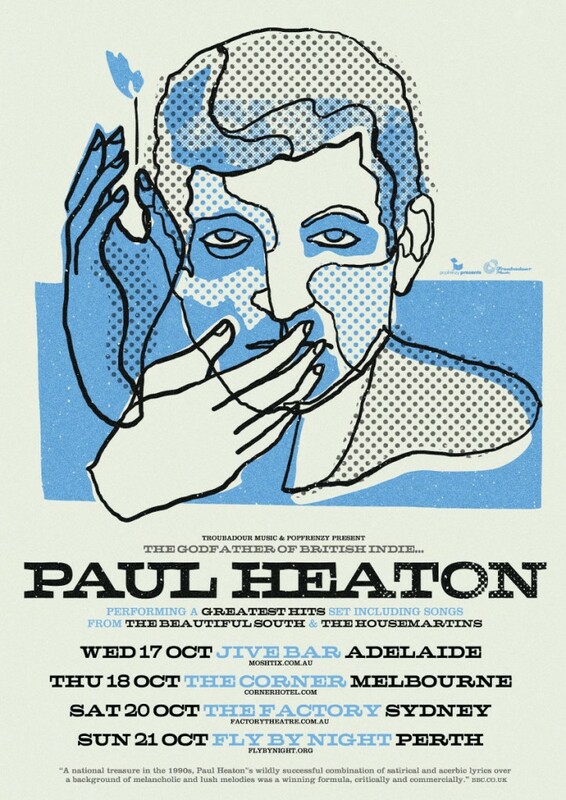 Thankfully Paul seems to have reconciled himself with his extensive back catalogue and the Australian gigs are promising a greatest hits set covering all of his career - Housemartins, the South and solo. I can hardly believe I'm typing those words. Despite having turned 50 this month, Heaton is fresh from writing and performing The 8th (the longest pop song ever) at the Manchester International Festival and undertaking another of his cycling pub tours of the UK, so it sounds like we're going to see an energised and engaged PD. I can't help but feel it will have been worth every minute of the long wait. So, Australian fans, let's get up off our knees and start compiling that dream set list... form an orderly queue in the comments section below.